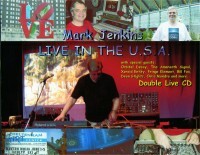 English synthesist Mark Jenkins played a series of concerts across Pennsylvania in 2005. This 2 CD set documents that occasion. Live in the USA is much like mid-period Tangerine Dream, but from Mark’s perspective. There are lots of pulsing sequencers, soaring guitars, and washes of analog and digital electronics. On this concert tour, Mark is joined at different times by members of the Pennsylvania synthesizer community: Orbital Decay, The Amaranth Signal, Xeroid Entity, Fringe Element, Bill Fox, Dean Stiglitz, and Chris Mandra. The music is good, though it does take some effort to make it all the way through both discs in one sitting. There are a couple of tracks that are distinctly different from the rest and they happen to be the opening tracks on Disc One. The 57 second “Intro” is a montage of audio clips from radio ads that is immediately followed by “The Star Spangled Banner.” I bet that you have never heard our national anthem performed in this manner. The only obvious connection is Mark’s vocoded recitation of the lyrics as the music is without melody. Overall Amp Records could have done a better job packaging this release. Instead of a jewel case, it comes in a slim DVD case that makes it difficult to store with your other CDs. And in order to read any information about the album, you have to slide the cover out of the case as everything is printed on its reverse. These are minor problems and should not interfere with your enjoyment of the music.